Education Secretary Alan Johnson has added his voice to attacks on trade minister Margaret Hodge over comments she made on housing allocation. Mr Johnson accused her of "using the language of the BNP" after she said British families had a "legitimate sense of entitlement" over immigrants. Jon Cruddas and Peter Hain, who like Mr Johnson are Labour deputy leadership hopefuls, have also attacked Mrs Hodge. She has said she was simply reflecting the concerns of her constituents. Mrs Hodge's Barking constituency, in East London, has been hit by a severe housing shortage, with the council house waiting list standing at more than 8,000 families. It has also seen a big increase in the number of migrants in recent years, with the non-white population estimated to have doubled since 2001. But Mrs Hodge's critics say she is wrong to suggest immigration is to blame for housing shortages, saying "only 1%" of social housing was occupied by foreign nationals. Mr Johnson launched an outspoken attack on Mrs Hodge on BBC One's Question Time on Thursday evening. He said: "There is no evidence whatsoever that immigrants are causing a problem with social housing." He added: "My problem with that is that's the kind of language of the BNP and it's grist to the mill of the BNP." Instead, he said there was a problem with a shortage of social housing and that more needed to be done to address the "real mismatch" between supply and demand. He said "immigrants do not go to the front of the queue" as housing was based on need. "Margaret's comments were made for her own reasons and I respect Margaret but I disagree with her," he added. Northern Ireland Secretary Peter Hain and backbencher Jon Cruddas, whose Dagenham constituency borders Barking, have also criticised Mrs Hodge's comments. Mr Cruddas said: "Housing is allocated according to need and it is disingenuous for Margaret Hodge to suggest otherwise. "The problem is lack of housing supply and it's a shame she wasn't so vocal in the campaign for the building of more council housing." On Tuesday, London mayor Ken Livingstone also weighed into the row, saying: "Margaret Hodge's suggestion that housing allocation should be based not on need but factors like length of residence would be catastrophic for community relations." The BNP, which is accused by its opponents of stirring racial hatred by blaming housing shortages on immigrants, won 11 of the 13 seats it contested in Barking and Dagenham in 2006 elections, making it the second largest party. The BNP's council group leader, Richard Barnbrook, reportedly tried to deliver a bouquet of white lilies to Mrs Hodge's constituency office to thank her for appearing to back his party's policy. According to the Evening Standard, the note read: "I am indebted to you for having the gumption to tell the truth about housing allocation. We must stop agreeing like this or people will think we are having a political agreement." But the council's Labour deputy leader Liam Smith branded Mrs Hodge's comments "nonsense". "It is not fair for her to play one group of people off against another. "Margaret Hodge is missing the point. The problem is clear, there are not enough council houses to meet the demand," he said. 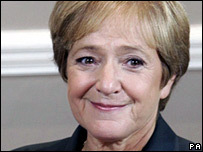 During the 2005 general election campaign, Mrs Hodge said the area's change from a white area to a multi-racial community had caused some Labour voters to be tempted by the BNP's policies. Speaking at the weekend, she called for social housing policy to take account of length of residence, citizenship and national insurance contributions. "We should look at policies where the legitimate sense of entitlement felt by the indigenous family overrides the legitimate need demonstrated by the new migrants," she said. Responding to the storm of criticism her comments provoked, she said she was aware it was a difficult issue, but she was listening to her constituents and wanted to start a debate. She won some support from Labour chairman and deputy leadership contender Hazel Blears, who agreed there was a need "to tackle these tough issues." A poll for BBC Two's The Daily Politics suggested 69% of voters believe British citizens should always get priority for social housing ahead of immigrants. But 56% thought Mrs Hodge's comments could damage community relations. Populus interviewed a random sample of 1,171 adults by telephone between 23 and 24 May.